Yummy, healthy dinner in half an hour--it tastes better than it looks in this picture! I can get this dinner on the table in 30 minutes—and it’s always gone in less than that. Aside from the obvious nutrition factor, the yumminess and the simplicity, the next great thing about this recipe is that it only needs one pot. Oh joy (and yes, I mean more than the dishwashing liquid). Start your water boiling in the pot while you prep the potatoes. You don’t need much water, an inch is fine (just make sure you don’t boil it dry). Arrange the potato rounds on the bottom of the steamer, then steam for 10 minutes or so, until they start to get tender. While the potatoes are steaming, start prepping the rest of the ingredients. Rub the fish slices with salt and pepper. I usually mix salt and pepper in a small bowl so I don't get fish gunk on my salt shaker and peppermill. When the potatoes are ready, put the fish slices on top of them (you don’t have to take the pot off the flame or the basket out of the pot—just be careful). Top the fish with tomato wedges. Sprinkle with dry basil or chopped fresh basil (chopping the fresh basil takes a little extra effort, but is worth it. If you don’t have fresh basil though, no biggie). Top the tomato wedges with asparagus pieces, if you have any. 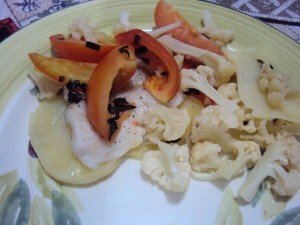 If not, I suspect other veggies like cauliflower (like what I used in the picture) would do fine, perhaps not as pretty though. I should try broccoli next. If you’re using cauliflower or broccoli, you could start steaming them earlier, with the potatoes, or you could blanch them beforehand. Or you could skip this step all together. Cover and steam for another 10 minutes, until the fish turns white and flakey. Turn the stove off. Squeeze a bit of lemon or kalamansi over each fish slice, then top off with a pat of butter. How much of lemon and butter depends on your taste; I like mine really buttery and lemony. Of course you could make the lemon-butter sauce beforehand (just melt some butter and add lemon juice), but I get a kick out of watching the butter melt over the fish. Using a turner, scoop out a slice of fish, the potatoes under it and the vegetables around it and serve. Voila! Dinner’s ready! Serves two hungry adults, a hungry preschooler and a hungry baby. Possibly with enough leftovers for a one-person meal the next day. This is best eaten right after you finish melting the butter on it. If you leave it a bit longer in the pot the veggies and fish get soggy. Oh and another great thing—making this truly a quick dish on the fly—I sometimes cook it with the fish straight out of the freezer. Truly in a rush? Skip the potatoes. No asparagus, cauliflower or broccoli? Skip those too. I haven’t tried experimenting yet, but some butter beans could work as well. It’s a flexible recipe. Let me know how you tweaked yours. Happy eating! Hey our fish comes from VIetnam daw, Ly. Should be an easy one for you to find. Enjoy!